Financial markets are caught in the crosscurrents of a shifting narrative from convergent global growth to divergent trade and monetary policies. A more hawkish Fed and European Central Bank and the Sino-US trade war cast an ever-fluid macro-economic backdrop for stocks and bonds. The intensifying global trade spat and stronger dollar are weighing on emerging market stocks. China, the Trump administration’s favorite sparring partner, saw its stock market fall over 17% this year. Other emerging markets struggled too as the dollar recovery found some economic pressure points. Investors are favoring US small stocks and large technology companies. Shares of smaller companies gained 7.8% in Q2, their best showing since Q4 2016. Shares of tech companies gained 6.8% in Q2 and are up 10.2% this year, benefitting as a perceived safe haven from global trade issues. The bond market has largely weathered the Fed’s rate hikes. The yield on the 10-year Treasury rose 0.11% to finish Q2 at 2.85%. The yield spread of corporate bonds widened to 1.23% over US Treasuries, coming within an earshot of the 5-year average of 1.27%. While all of this seems a bit dramatic, it pales in comparison to the over 70% decline in bitcoin, as the air comes out of the digital currency that everyone was clamoring for last year. Comb through the investing section of any library and you are bound to find a deep bench of books on value investing. Value investing comes in many forms but ultimately focuses on acquiring assets for less than their perceived worth. It’s hard to argue with this approach. In fact, it seems as though nothing else but value investing should work. But recently, value investing has been out of favor. Academic and quantitative investors have shown that value investing does work – in the long run. The cheapest group of companies in the market over time tend to outperform companies that the market prices more dearly. Since 1926, the cheapest stocks in the US market have beat the market by about 3% per year, which means that $100 invested in value stocks have accumulated to more over $1,500 more than the same $100 invested in higher-valued growth stocks. Recent experience has been less than average. Value stocks have lagged their higher-priced comparators by about 2% per year over the last five years. Behind this are the so-called FAANG stocks (Facebook, Apple, Amazon, Netflix and Google) which account for the majority of recent market gains and are also carry a premium valuation, trading at 33 times earnings as a group compared to 19 times for the S&P 500. Given this outperformance, is value investing a thing of the past? Does it mean we are in the midst of another bubble with disregard for fundamentals? It’s not clear what ultimately drives the performance of value stocks. Some say value stocks are inherently riskier. After all, these companies with perceived lower growth may be more likely to go caput during economic downturns - perhaps due to higher debt or assets that can’t be retooled for other opportunities. 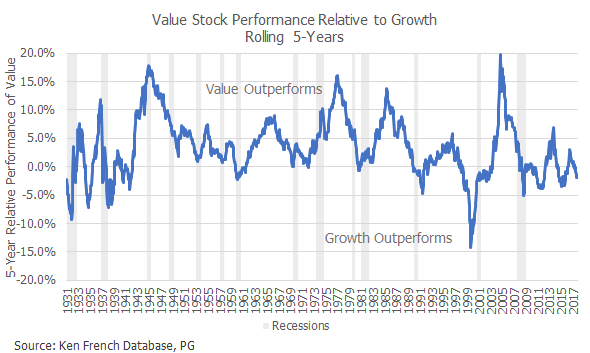 But, the track record suggests this may not always hold as there are several cases of “value” beating “growth” during slow growth and recessionary periods. Despite comparisons between now and the tech bubble, the current episode is relatively benign. During the tech bubble of 1999-2001, value stocks underperformed higher-priced companies by 54% as the valuations on growth stocks hit astronomical levels. While value-oriented investors may be pulling their hair out watching Netflix double in price this year and trade at whopping 262 times current earnings, we are nowhere near the broad tech bubble experience in breadth or magnitude. It may be that value stocks work in the long run simply because investors have to be willing to hang on in periods of poor relative performance. It’s likely no coincidence that the relative performance cycles about every three to five years – the same frequency which many institutional managers are evaluated. The closest thing to an investing superpower is the ability to stick with a sound strategy through the ups and downs. We doubt value is dead, but we also don’t know when it will make its comeback. Betting too much on one style or strategy is never wise. Taking concentrated risks increases the chance of throwing in the towel at the wrong time. The Obama-era rule requiring brokers and financial advisors to put their clients’ interests ahead of their own was struck down by a panel of judges this past month. Industry lobbyists finally won out, arguing that the costs of complying with the rule would be too great. It is unfortunate that there are still a number of institutions, primarily banks, brokerage firms, and trust companies that are not legally required to act in their clients’ best interest. As an SEC-registered investment advisor, ProffittGoodson has always and will continue to operate as fiduciaries, placing client interests first and foremost in everything we do. The markets have a tendency to shoot first and ask questions later. The knee-jerk reaction so far has been to reward shares of smaller, domestic companies. Paradoxically, it may be the larger companies that can better withstand a trade war with diversified suppliers and global mobility. 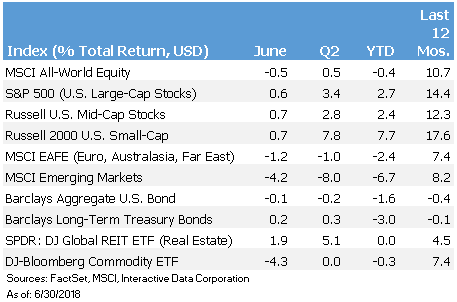 We recently reduced our emerging market stock position, where trade-related risk is highest, and increased our allocation to larger global companies. The global macro outlook is murky at the moment despite signs the global economy is hanging in there. The market will likely continue to move swiftly on the latest trade discussions even though the impact on growth will be marginal. Heading into the second half of the year, we continue to be invested but cautious, focusing on quality and safety. Now is not the time to be sticking one’s neck out in any particular direction. It’s important to maintain balance and the ability to weather unexpected ups and downs. If you would like to discuss your particular situation more closely, please don’t hesitate to reach out to us.